A tatami (畳) is a type of mat used as a flooring material in traditional Japanese-style rooms. Traditionally made using rice straw to form the core, the cores of contemporary tatami are sometimes composed of compressed wood chip boards or polystyrene foam. With a covering of woven soft rush (igusa) straw, tatami are made in standard sizes, with the length exactly twice the width, an aspect ratio of 2:1. Usually, on the long sides, they have edging (heri) of brocade or plain cloth, although some tatami have no edging. 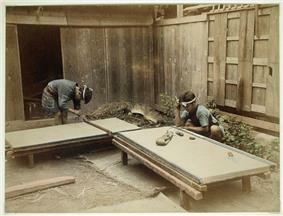 Men making tatami mats, late 19th century. The term tatami is derived from the verb tatamu, meaning to fold or pile. This indicates that the early tatami were thin and could be folded up when not used or piled in layers. Tatami were originally a luxury item for the nobility. During the Heian period, when the shinden-zukuri architectural style of aristocratic residences was consummated, the flooring of shinden-zukuri palatial rooms were mainly wooden, and tatami were only used as seating for the highest aristocrats. In the Kamakura period, there arose the shoin-zukuri architectural style of residence for the samurai and priests who had gained power. This architectural style reached its peak of development in the Muromachi period, when tatami gradually came to be spread over whole rooms, beginning with small rooms. Rooms completely spread with tatami came to be known as zashiki (lit., room spread out for sitting), and rules concerning seating and etiquette determined the arrangement of the tatami in the rooms. It is said that prior to the mid-16th century, the ruling nobility and samurai slept on tatami or woven mats called goza, while commoners used straw mats or loose straw for bedding. The lower classes had mat-covered earth floors. Tatami were gradually popularized and finally reached the homes of commoners toward the end of the 17th century. 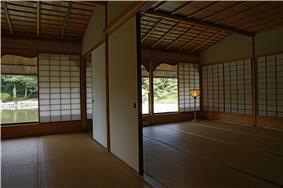 Houses built in Japan today often have very few tatami-floored rooms, if any. Having just one is not uncommon. The rooms having tatami flooring and other such traditional architectural features are referred to as nihonma or washitsu, "Japanese-style rooms". The size of tatami differs between different regions in Japan. In the Kyoto area, tatami generally measure 0.955 m by 1.91 m. Tatami of this size are referred to as Kyōma tatami. Tatami in the Nagoya region generally measure 0.91 m by 1.82 m, and are referred to as ainoma (lit., "in-between" size) tatami. In the region around Tokyo, tatami generally measure 0.88 m by 1.76 m. Tatami of this size are referred to as Edoma or Kantōma tatami. In terms of thickness, 5.5 cm is average for a Kyōma tatami, while 6.0 cm is the norm for a Kantōma tatami. A half mat is called a hanjō, and a mat of three-quarter length, which is used in tea-ceremony rooms (chashitsu), is called daimedatami. In terms of traditional Japanese length units, a tatami is (allowing for regional variation) 1 ken by half a ken, or equivalently 6 shaku by 3 shaku – formally this is 1.81818 metres (5.9652 ft) × 0.90909 metres (2.9826 ft), the size of Nagoya tatami. Note that a shaku is almost the same length as one foot in the traditional English/American measurement system. In Japan, the size of a room is often measured by the number of tatami mats (-畳 -jō), about 1.653 square meters (for a standard (Nagoya) size tatami). Alternatively, in terms of traditional Japanese area units, room area (and especially house floor area) is measured in terms of tsubo, where one tsubo is the area of two tatami mats (a square); formally 1 ken by 1 ken or a 1.81818... meter square, about 3.306 square meters. Shops were traditionally designed to be 5 1⁄2 mats, and tea rooms are frequently 4 1⁄2 mats. There are rules concerning the number of tatami mats and the layout of the tatami mats in a room. In the Edo period, "auspicious" tatami arrangements and "inauspicious" tatami arrangements were distinctly differentiated, and the tatami accordingly would be rearranged depending on the occasion. In modern practice, the "auspicious" layout is ordinarily used. In this arrangement, the junctions of the tatami form a "T" shape; in the "inauspicious" arrangement, the tatami are in a grid pattern wherein the junctions form a + shape. An inauspicious layout is said to bring bad fortune. ^ a b Kodansha Encyclopedia of Japan, entry for "tatami." ^ a b c d Sato Osamu, "A History of Tatami," in Chanoyu Quarterly no. 77 (1994). ^ Kodansha Encyclopedia of Japan, entry for "bedding"
^ "The Yoshino Newsletter". "Floors/Tatami". ^ "Kyoto International Community House Newsletter". 2nd section titled History of tatami.